I'm trying to install spaCy using pip install spacy but I'm getting the following error .. I have VS 2015 installed, and I have the following Python install .. I tried the following SO solutions to no avail ..
As well as various others. This is not a unique problem to this specific library but more generally anytime I try to install Python libraries that need C to build on Windows. You may need to have cl.exe in your PATH. PATH is an environment variable that tells Windows where to find executable files when you just give it the name. By default it contains locations such as C:\Windows. Use the Visual C++ Command Prompt. You can find it in the Start Menu under the Visual Studio folder. This sets up PATH automatically. Add the folder cl.exe is in to the PATH manually. The folder you're looking for is generally (visual studio folder)\VC\bin. Instructions can be found in this answer. After this you can use cl.exe from any Command Prompt. Note that you have to restart the Command Prompt after this in order to update the PATH in it. I hope that it helps someone too. Just added to the answer from Kunal Mathur and an answer to @mockash, since I cannot comment due to lack of reputation. this is not valid for just this package, but for any package that cannot compile under your own windows installation. I was facing the same problem with visual studio 2017.
you can find cl.exe in C:\Program Files (x86)\Microsoft Visual Studio\2017\Community\VC\Tools\MSVC\14.16.27023\bin\Hostx86\x86. 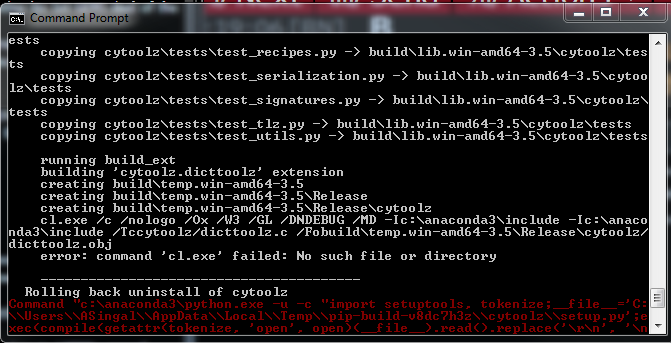 just set the environment variable as the able address and run the command in anaconda, it worked for me. I had come across this problem many times. There is cl.exe but for some strange reason pip couldn't find it, even if we run the command from the bin folder where cl.exe is present. Try using conda installer, it worked fine for me. And to my surprise it gets installed without an error once you have the right version of vs cpp build tools installed, i.e. v14.0 in the right directory. create a virtual environment using conda. Activate the environment and use conda to install the necessary package.